No. 25, Jalan Utama 2/30, Taman Perindustrian Puchong Utama, 47140 Puchong, Selangor, Malaysia. 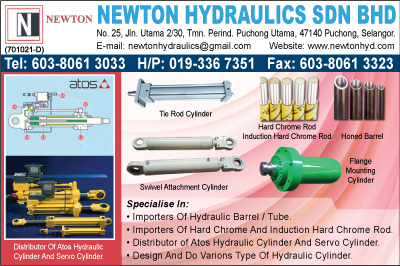 Newton Hydraulics started as a company that provide service, trouble-shooting and repair jobs on Hydraulic System, today with more than 15years of expertise, we provide Design, Advise, Supply, Fabrication, Installation complete with testing and commissioning of Hydraulic System for various field of industry. 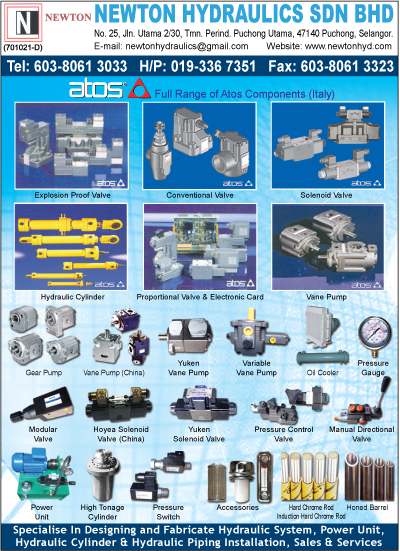 With our very reliable Atos Hydraulic Components and High Technology we now supply our Components, Cylinder and Systems that coversIndustrial, Precision Automation, Engineering, Construction, Mobile, Marine, Power Station, Steel Mills, Oil and Gas and so on. 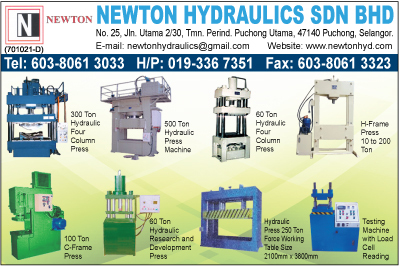 Our extra experience and Technology in Design and Built Hydraulic Press Machine and Hydraulic Machine for our customer is yet one of our extra resources. Assuring you of our prompt and best back up service we provide one year warranty on every Hydraulic System that install and commission by us. Here, we hope we will be given a chance to growth with you with our well train sales staff, skillful and Experience Technican.